When I started in my new career in 2006 as a Bra Fitting Specialist, little did I know how passionate I would become about Breast Health. My mission was to be the best fitter I could be and got involved in the training and Certification process with over 8 different bra supply companies and also became educated and Certified as a Mastectomy Fit Specialist to help ladies lead a full life after breast surgery. My journey started by helping women choose a better fitting bra that would improve her posture, comfort level and self esteem. I also became more aware of the issues affecting our overall health that in turn impacts our breast health. If we want our breasts to remain healthy, it starts with a healthy body and diet and lifestyle are two of the most important things we have in our control to reduce the risks of inflammation, sickness and disease. Over these past 11+ years, I have gained much knowledge from great leaders on the subject of Breast Health. One component they all stressed that can make a huge difference in our overall healthy was our diet and lifestyle. I truly believe if we give our body the nutrition it needs - it can heal itself. We also need to learn how to read labels on our food, household cleaning products and personal care products as we can absorb and inhale toxic contaminates which may be hiding in them. In our busy lives today – most of us struggle with our nutrition. Diabetes and obesity are on the rise as well as new named diseases that we never even heard of years ago. We eat too many processed foods and not enough of whole foods like fruits and vegetables. All of our societies like the Arthritis, Cancer, Diabetes, Heat & Stroke stress the importance of consuming over 7-10 fruits every day. Fruits and veggies contain precious antioxidants we need inside our bodies each and every day to combat the effects of oxidation stress. I have found a simple and easy solution to bridge that gap – Whole Food Nutrition by Juice Plus. Juice Plus is safe and effective and has proven results. It is the most thoroughly researched supplement in the world today with over 34 published Gold Standard research studies to date. 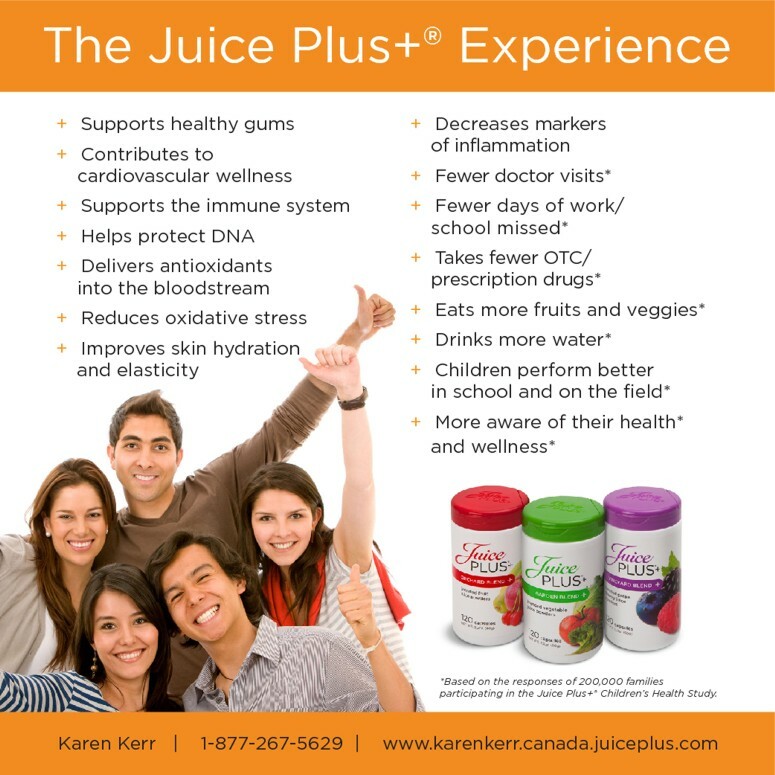 Please follow these links for more information on Juice Plus. Shop for Juice Plus Products and Learn More by clicking Here.